Here’s a simple hockey math question. 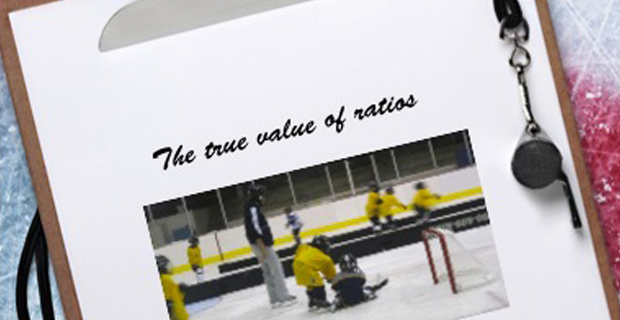 It’s only a trick question if you see player to coach ratios as simply a matter of mathematics. It isn’t of course, though most people would see it that way. If a team or hockey program has lots of people on the ice, then it must be doing something right, right? I never thought so. Just look at these two recent examples of hockey schools. Example 1: A summer program has about 30 kids on the ice. They’re doing skating exercises in waves up and down the rink. A few young guys, probably junior players, are directing the kids where to go and what to do. There’s no error correction. Meanwhile, standing on the side boards near centre ice is the head instructor, a former NHLer, along with two other young fellows. They’re chatting. I counted 8 on-ice personnel for a ratio of 30:8 or nearly 4:1. Yet not one instructor gave an iota of feedback or assistance, apart from directing kids on how to do the drill properly. Example 2: Another summer program, this time in a smaller rink whose size is perfect for kids to play. There are 15 in the camp with 4 instructors (as in the question at the outset). The head guy has a good rapport with the kids. They run them through a few drills, the last of which involves a pylon course. Each child must skate to a pylon, stop, then go across to another, for five stops in all. But the pylons are set diagonally across from each other so that when the child looks up to go to the next one, they need to search a bit. Besides, the kids don’t stop well. Most just glide by. At no time during this drill did any of the instructors, including the lead fellow, stop them or correct them. They just carried on, perfecting their poor techniques. In both examples though, there were plenty of opportunities and more than enough staff to provide nearly every skater with some constructive help. Perhaps the ratio was a sales feature of the camp. And let’s face it, if you were told your child’s grade four class would have not one, but three teachers, you’d be tickled. More help for your child more often from trained professionals. Therein lies the difference. These two hockey schools had no trained professionals. Even the ex-pro was an ex-player, not a trained hockey teacher. The rest were young people with little or no teaching experience and getting no guidance or mentoring from those around them. In short, be wary of advertised low ratios.